After starting the month with many sub-zero F temperature readings around the state during the first week, including a national low of -12 F at Embarrass on the 6th, many Minnesota observers reported 11-12 consecutive days with above normal temperatures and several new daily record warm minimum values and record daily warm maximum values were set over the 13th to the 15th. In addition MSP set a new all-time record high dewpoint for so late in the month with a reading of 49 F on the 15th, that corresponds to the average dewpoint for early June or mid-September. A full report on this mild spell of weather around the state is available at the MN-State Climatology Office web site. With the warm spell much of the state lost a great deal of snow cover recently. Much of the state has seen little snow this month anyway, with only portions of northeastern Minnesota reporting 10 or more inches. But the other shoe will drop, as it usually does. Starting this weekend there will be chances for snowfall before Christmas Day, then much cooler temperatures for the balance of the month with more chances for snowfall between Christmas and New Year's Day. So snow lovers may yet have a smile on their face by the end of the month. It is still likely that overall December will end up warmer than normal for most areas of the state. The North American Aerospace Defense Command (NORAD) will again be tracking Santa as he travels the globe on Christmas Eve. He has a lot of ground to cover. 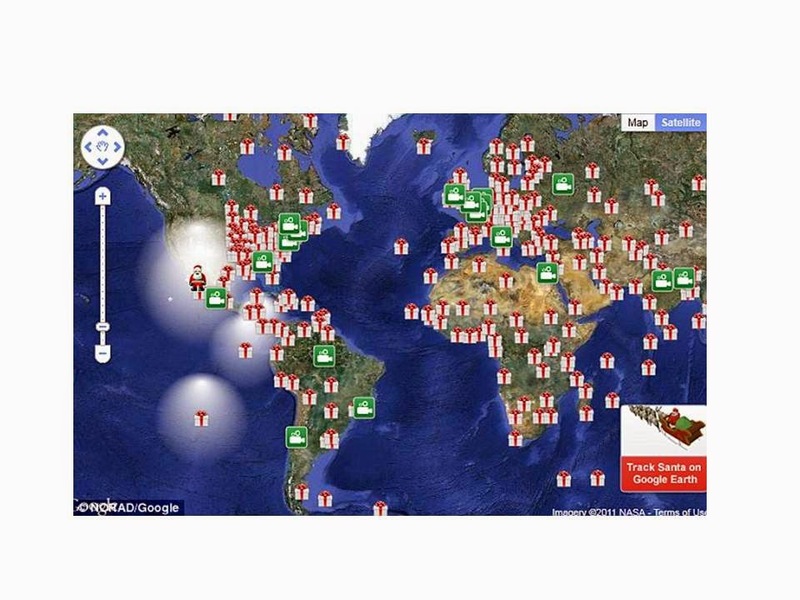 You can follow his progress by going to the NORAD Santa web site. For those of us who live in Minnesota it looks like Santa may have to navigate through some snow on Christmas Eve as there will be some snow showers across the state. At least temperatures will be normal and not terribly frigid. I am sure Santa and his reindeer will still appreciate a hot beverage and some cookies left out for his home visits. The NOAA-National Climatic Data Center has kept records of climate extreme values for each state. They are available at their web site and may be of interest to many citizens. It is evident that a number of all-time record values in each state have occurred over recent decades. You can find this information at the NOAA-NCDC Extremes Records Section of their web site. -Since Thanksgiving, periods of significant precipitation have fallen across California. In valley locations, rain has boosted topsoil moisture, benefited winter grains, and helped to revive rangeland and pastures. According to USDA/NASS, 30% of California's rangeland and pastures were rated in good to excellent condition on December 14, compared to just 15% on October 26. -The latest U.S. Drought Monitor (Dec 18) indicates that there was a substantial reduction in D4 (exceptional drought) coverage in northern and central California. Statewide, D4 coverage fell from 55 to 32% -- the smallest area in exceptional drought since early-June 2014. However, overall drought (D1 to D4) coverage declined only slightly, from 99.7 to 98.4%. In other words, nearly all of the state remains in drought, although the drought intensity has decreased by one category in parts of northern and central California. This week the United Kingdom Meteorological Office provided an update on global temperature anomalies for 2014. It is obvious that 2014 will be among the warmest years measured since 1880 no matter what happens weatherwise for the remainder of the year. NASA/Goddard Space Flight Center released an analysis this week showing that holiday brightened cities emit increased light intensity that is detectable on the NASA/NOAA Suomi NPP satellite system. Using the Visible Infrared Imaging Radiometer Suite sensor NASA has routinely mapped the images of "Earth at Night." These images clearly show brighter, more intense light coming from various cities during the Christmas and New Years holidays in the USA and during Ramadan in the Middle East. The persistent warmth earlier this week over the 13th to the 15th was remarkable. I don't remember anything like it in December. Were any new statewide daily temperature records set? Indeed, at least 12 climate stations reported new daily warmest maximum temperature readings over December 13-15, including readings of 56 F at Redwood Falls, 52 F at Worthington, and 51 F at MSP. But none of the maximum temperature values were statewide records. More significantly, December 13-15, brought new record warm minimum temperatures to 121 climate stations in Minnesota, with scores of readings in the 40s F. Two days brought new statewide daily warm minimum temperature readings: on December 14th Marshall reported a low temperature of 46 F breaking the old statewide record of 40 F set at Red Wing in 1891; and on December 15th Owatonna reported a low temperature of 45 F surpassing the former statewide warm minimum temperature record for the date of 40 F at Winona in 1928. The average MSP high temperature for this date is 25 degrees F (plus or minus 13 degrees F standard deviation), while the average low is 11 degrees F (plus or minus 14 degrees F standard deviation). MSP weather records for this date include: highest daily maximum temperature of 52 degrees F in 1923; lowest daily maximum temperature of -11 degrees F in 1983; lowest daily minimum temperature is -29 degrees F in 1983; highest daily minimum temperature of 38 F in 1923; record precipitation of 0.51 inches 1968; and record snowfall is 6.4 inches in 1951. Average dew point for December 19th is 10 degrees F, with a maximum of 39 degrees F in 1918 and a minimum of -31 degrees F in 1955. The state record high temperature for this date is 60 degrees F at Madison (Lac Qui Parle County) in 2011. The state record low temperature for this date is -52 degrees F at Mora (Kanabec County) and Tower (St Louis County) in 1983. State record precipitation for this date is 1.35 inches at Luverne (Rock County) in 1902; and the state record snowfall for this date is 11.5 inches at Two Harbors (Lake County) in 2008. A major winter storm crossed the state over December 19-21, 1902 bringing a mixture of precipitation and high winds. In southern counties much of the precipitation came in the form of rain, while in central and northern counties it was snow. At least 15 climate stations reported over 1 inch of precipitation and some reported 5 to 8 inches of snow. December 19, 1923 was the warmest in state history with 35 cities reporting highs of 50 F or greater. Duluth and Two Harbors reported 51F that day, while Winona reported a high of 55F and a mild low of 37F. By far the coldest December 19th in state history occurred in 1983. In fact the entire week before Christmas was one of the coldest in state history. Overnight lows of -30F were common and 35 communities reported lows of -40F or colder, including -40F at Zumbrota and -41F at Jordan. The high temperature at Ada was -20F. Windchill values were dangerously low all day. December 18-20, 2008 brought heavy snow to many parts of the state. In southeastern Minnesota Harmony reported 8.5 inches, but in the northeast even heavier amounts were reported with 14 inches at Duluth and nearly 20 inches near Two Harbors. It was a very snowy December in 2008 with widespread reports of 30 to 50 inches for the month. Warmer than normal on Saturday with increasing cloudiness and a chance for precipitation by evening. Continued warmer than normal on Sunday and Monday with chances for mixed precipitation, mostly snow in the north. Good chance for snow statewide on Christmas Eve, carrying over into Christmas Day. Then cooler and drier for much of next week.